The 2016 Vosne-Romanee 1er Cru Les Beaux Monts, which is matured in 50% new oak with around 30% stem addition, has a deep purple color. The bouquet is very floral and extremely detailed with crushed violet and rose petal scents embroidered into the blackcurrant and wild strawberry aromas. The palate is medium-bodied with fine-grain tannin. This certainly leans toward the dark side of the fruit spectrum?blackcurrant, boysenberry and touches of white pepper and garrigues toward the structured and almost Malconsorts-like finish. This will really benefit from five or six years in bottle, but there is good potential here. 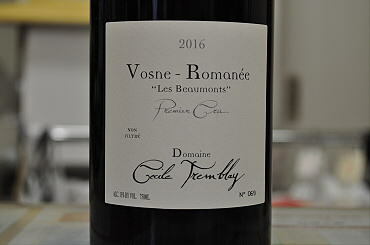 Despite some reduction on the nose, the 2015 Vosne-Romanee 1er Cru Les Beaux Monts, which included whole bunch fruit, has a very well-defined, floral bouquet that expresses its terroir with style. This has great intensity while upholding superb delineation. The palate is medium-bodied with supple red berry fruit, a slight savory element here that becomes more pronounced towards the finish. It leaves a seductive, almost gamey/dried blood aftertaste. This has good potential once in bottle - a Les Beaux Monts with plenty of character.